The RAPID Decision Making Model is a framework that can help organizations make better decisions. Making high-quality decisions is critical to organizational success. Every success an organization achieves. Every failure. Every missed opportunity. They can all be traced back to a decision or series of decisions made by the organization. Two organizations have been hired to complete a project for another organization. Neither company fully understands exactly where their responsibilities start or finish. This leads to confusion and disagreement. It is also not entirely clear who decides the way forward when a disagreement does arise. A senior manager in your organization makes a promise to deliver a project by a certain date. The decision is made without involving any of the team which will deliver the project. This leads to stress and frustration within the project team. They have to try and work out how to deliver against the promise made. How can we avoid these kinds of problems happening? One solution is to use a formal decision-making process. The RAPID Decision Making Model is one such process. 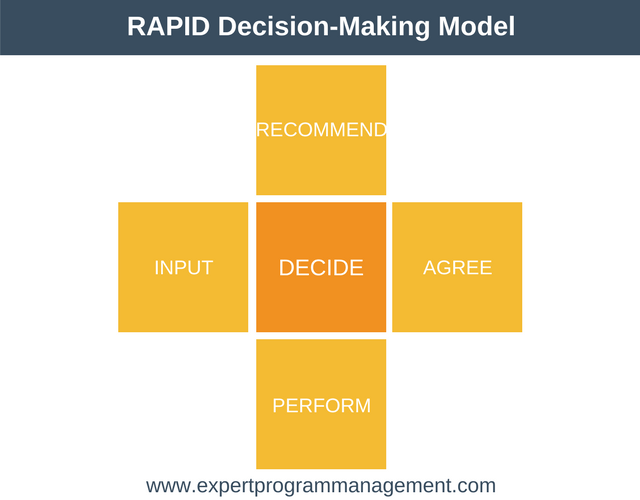 The RAPID Decision Making Model works by clarifying who should do what for each complex decision that needs to be made. The model was developed by Bain & Company. Not all decisions need to use a formal model. Simple decisions with limited consequences are better made without the overhead of a process such as the RAPID model. There are two or more functional units or teams involved. Both global and local teams are involved. One or more suppliers are involved. Where the RAPID Decision Making framework comes into its own is when big decisions need to be made. The RAPID Decision Making Model gives organizations a clearer way to make decisions. The letters in RAPID stand for the key people involved in any decision. These key roles are Recommend, Agree, Perform, Input, and Decide. The central role of the model is the Decide role, with all other roles supporting this role. The person or persons in this role recommend a course of action or present a series of options. They should back up their recommendations using facts, figures, and research. You can think of this role as being the starting point for the RAPID process. A recommendation is proposed and the rest of the decision-making process flows from there. These are the people who must agree with a recommendation before it can move forward. This group has the power to veto the decision if appropriate. It is important to keep this group to as few people as possible or decision making can slow down. If they do veto the decision then they must negotiate with the Recommend role to adjust any recommendations until they are satisfied. If a satisfactory alternative can’t be found then the issue should be escalated to the Decide role. The Input role provides the foundation for good decision making. This role is consulted to provide hard facts, data, and evidence as input to a recommendation. How long will the recommendation take to implement? Are there any risks involved in the execution? Are the key teams happy with the proposal as it stands? Note that the Recommend role doesn’t have to take on board the information from the Input role. This rule acknowledges the fact that consensus can be an impediment to decision making speed. When all of the options are on the table a decision must be made. This role is the decision maker and it should be a single person. This role is usually filled by a senior leader within the organization. Once a decision has been made it is important action commences on it quickly. The decision maker delegates implementing the decision to the Perform role. They maintain responsibility for the work whilst it is under execution. This role corresponds to the people who will perform the decision. It is important that each decision is acted on quickly. A decent decision executed quickly is often better than a great decision executed slowly. So far our discussion has been very theoretical. Let’s look at an example to bring RAPID decision-making to life. An example of a RAPID Decision Matrix shown below. As you can from the matrix, each key decision of a particular project occupies a row in the matrix. In the above example, we are looking to decide if we should insource or outsource a part of the project. One person, DG, responsible for ultimately deciding whether we insource or outsource. We have two people who will recommend whether we should insource, outsource, or a combination of both. These are AAP and CF. Two whole of the leadership team will provide input to the recommendation. One team member from our external suppliers will provide input, BP. Finally, one member of the project team will provide input to the recommendation, KG. One member of the leadership team has the ability to veto any recommendation and must be brought on side, DS. Finally, the entire project team will be tasked with executing any decision that is made (Perform). You can download our RAPID Decision-Making Model template as shown above here. Feel free to change and adapt the template to assist you in your decision making. It gives all the key people a chance to be involved in decision making. You are more likely to achieve employee buy-in if you involve them in the decision-making process. You can even remove unhelpful people from the loop if necessary. It ensures that decisions are made in a carefully considered manner, resulting in higher quality decisions. It makes it absolutely clear who is responsible for each part of the decision. To work effectively it requires the buy-in of the entire organization. This means both top management right the way down to workers at the coalface. It can slow down decision making. For this reason, it should only be used for larger, more important decisions. 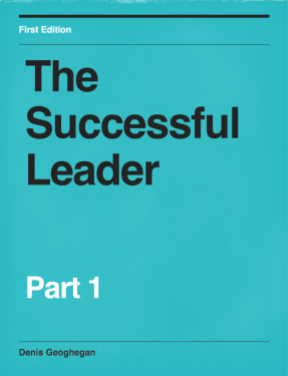 The most successful organizations use simple tools to be effective. The RAPID Decision-Making Framework is a tool which can be used to make better decisions. It’s an involved process so should be only be used for difficult or complex decisions. Recommend: create the initial proposals and recommendations. Agree: Must agree the proposals from the Recommend group. Perform: Execute the work after the decision is made. Input: Provides information and facts to the Recommend group. Decide: The person who has the authority to make the decision. To be successful, the RAPID Decision-Making framework needs support throughout the organization.